How to configure Zapier and connect your WarriorPlus account to it. Zapier allows you to easily connect apps that you use everyday with your WarriorPlus account. You can connect to such popular services as email providers and other apps such as Trello or Dropbox and automate repetitive tasks. The WarriorPlus app is a triggered app so, it performs an action based on one of 3 triggers you can enable. A trigger is simply a defined action which triggers a response. A new affiliate request could trigger different function via Zapier apps for Trello or Dropbox or a combination. You might want to automate sharing information among different applications you use such as Evernote or Trello. You can see where this is going -- you can chain apps together to create automated workflows. The Zapier app setup steps are very intuitive and the platform will even detect when you’re missing a step and help you correct it. In just a few minutes you should have your app configured and enabled. Triggers when a new affiliate request is made for an offer. 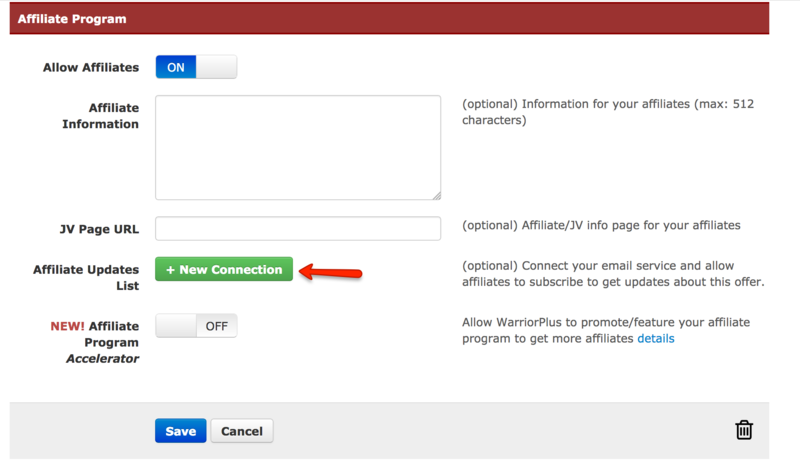 NOTE: In order for WarriorPlus to send data to Zapier, you must select your Zapier integration in the Offer Editor. NOTE: In order for WarriorPlus to send data to Zapier, you must select your Zapier integration in the Product Editor. See a screenshot here. Triggers when a new prelaunch signup is made. 1) On the Service Integrations page, https://warriorplus.com/user/service/email.php, select ‘Zapier’ as a new service. 2) Name this integration and save it. You will need the API key value shown on the account detail page later. In most cases, you will only need one integration configuration (e.g. one API key) to create multiple Zaps. CAUTION: If you re-authorize the credential, the API key will change and your existing Zaps will stop working. Do not re-authorize the account unless you want to invalidate all existing Zaps. 3) Connect your offer or product. Set up all product and/or offers you want to integrate. 3) Three triggers are available. Select one of them (create multiple Zaps as needed). For example, if you want a specific button tracking code (SID) to trigger for this Zap, select a SID from the dropdown menu. CAUTION: If you add a filter for a product of an offer, make sure that Zapier integration is selected for those product or offer in WarriorPlus. WarriorPlus pushes data to Zapier only if the integration is configured at the product or offer level. 7) Follow rest of the Zap creation steps. (the WarriorPlus app is not available as an Action app at this time).